Okay, we all have a different definition of famous – but the wonderful folks at Enjoy Life Foods have featured this recipe on their blog. You can view the full post here on the ELF blog. I know, I know, it isn’t exactly Martha Stewart, but this company is fairly big, and one of my favorites. They use a dedicated allergen-free and gluten-free facility, which is hard to find these days. And, some of their products are surprisingly awesome. I love, love, love their mini chocolate chips (yes, they are even soy-lecithin-free), and their soft cookies. They are gluten-free, which I am not, but still awesome all around. I enjoy their granola too, but I am mostly a bake-at-home granola eater. Recipe adapted from my No Bake Granola Bar recipe in Go Dairy Free: The Guide and Cookbook for Milk Allergies, Lactose Intolerance, and Casein-Free Living. Since I often make mini-batches of no bake snacks, but I don’t have an assortment of mini-pans, I typically make “rounds” instead of bars using silicon muffin pans. No cutting or greasing required, and anytime we need a snack, we just pop one out! This recipe is dairy-free, egg-free, soy-free, and optionally gluten-free, nut-free, and/or vegan. This recipe is Dairy-Free, Egg-Free, Soy-Free, Wheat-Free, optionally Gluten-Free, optionally Nut-Free, and optionally Vegan. In a medium-sized saucepan or skillet, combine the two sweeteners and the oil, and gently warm over low heat while stirring until the sugar crystals have dissolved. This should just take a couple of minutes. Stir in the nut or seed butter, vanilla, and salt until smooth. Remove from the heat. Allow the mixture to cool for a couple of minutes. Stir in the flaxseed, followed by the oats and cereal. Now you have two choices here. If you want the chocolate chips to stay intact, let the mixture cool for few more minutes, and then stir in the chocolate chips. Or, if you are antsy like me, stir in the chocolate chips right away. They may melt a little against the warm pan, but I like them that way. The mixture will be crumbly, but that is okay. Press it firmly into an 8 x 8 pan (use saran wrap or wax paper over your hand if it threatens to stick while pressing) or into 10 to 12 muffin tins. Make sure it is packed in there nicely, then place the bars into the freezer to chill for 30 minutes to an hour. Cut into bars or pop them out and eat. I store them in the refrigerator, this keeps them fresh and from getting too soft. OH my god. I already printed out your recipe with the pictures so i can make them this weekend! hahahah 🙂 Thank you for sharing the recipe Alisa…ahhh looks So good! Wow your granola bars look far better than any storebought ones that I’ve ever had. These babies have substance. I saw that!!! I am so proud of you!!! I consider that famous! The granola bars sound delicious!!! Yum! I made these in mini muffin cups. Perfect treat for the kiddos and their lunch boxes! Oh my! You make these look absolutely amazing. I’m going to try to make them and hope they turn out half as good as these look. Great suggestion by Sassy Stephanie to put into lounch boxes. 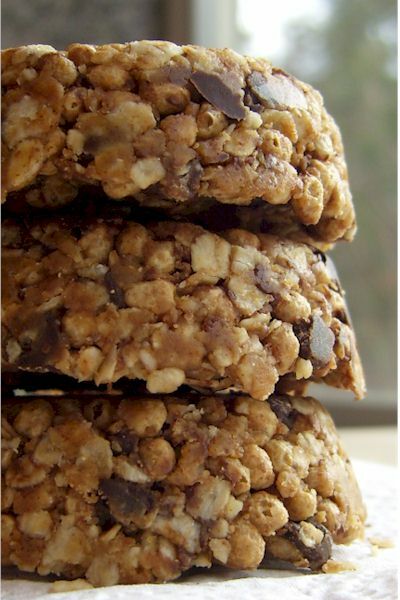 that is so great that you can make this oat bar without baking it! 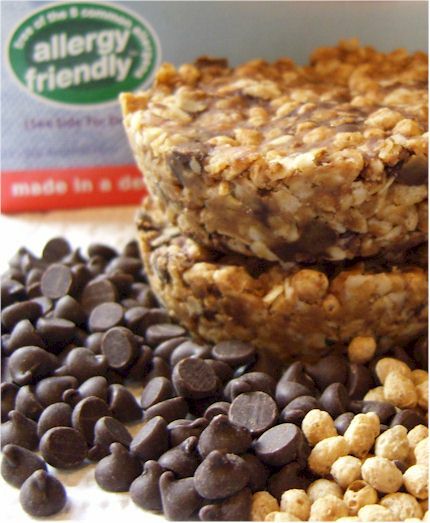 it looks like a wonderful healthy snack, but with some nice chocolate chips for sweetness! Re your bugs and the CSA. Well if the food looks and smells ok, after a thorough washing, it’s probably fine. That said, mentally I could not get my head around that and seeing it would make my skin crawl and there’s no way in heck I could eat that food…blech!!! Thx for the great comments today, esp the pic of me/Skylar looking mischievous …ha! so true though! Those looks really really good. 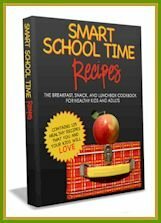 I love crispy rice cereal so I have have to try the recipe with that! Enjoy Life mini chocolate chips are the only chocolate chips I buy! I hate that almost every other brand has soy in it. I just made these today and while they turned out delicious, they didn’t stick together in the muffin tins too well. I’m thinking I should use more maple syrup and sunbutter next time. It hasn’t, however, stopped me from eating two helpings already. I’m going to send one to school tomorrow with my daughter. Thanks Alisa. Sassy Stephanie – Great idea on the mini muffin tins! Rhonda – no bake bars can be finicky. Make sure you use the coconut oil called for and freeze the bars until solid. The coconut oil helps to make them nice and firm. If that isn’t the problem, then it is probably just a difference in the nut/seed butter you used from what I used, since they even very by brand in oils, thickness, etc. You may want to add a bit more nut butter, and I would add a touch more coconut oil or palm oil. If you want a sweeter bar, go for it with the maple syrup. You can even combine the ground flaxseed with the maple in advance, before adding to the recipe. I find this helps to “glue” up the flaxseeds. Those look great. I love that they are no bake. It makes them a perfect summer time snack. These look like the perfect little snack. Plus they are no bake – gotta love that! Oh wow, I made something pretty similar the other day — but in chocolate form! Super yummy, I’ll have to try your version soon! Oh my gosh, awesome! I subbed Envirokidz Koala Crisp cereal because Perky’s is not vegan. I also packed them into mini muffin tins, which is a good thing because with the change in cereal, these were really sweet! Next time I will tweek it some depending on what I’m subbing, but I will definitely make these again. Yum! These look delicious–love the idea of making them in the silicon muffin pans too. 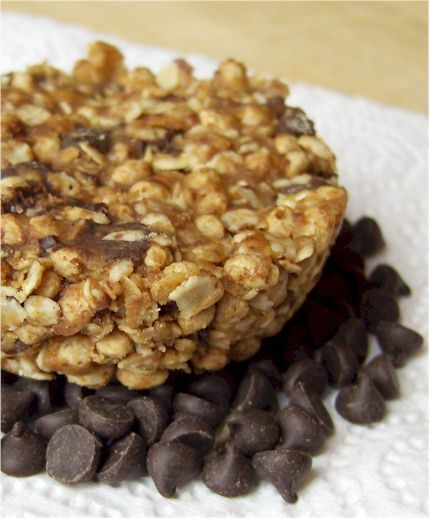 These healthy homemade bars sound just perfect for breakfast! bookmarked to make very soon! I am SUPER excited to make these – they look amazing!!! I just made these, they tasted great! But I decided to forgo the brown sugar to make it healthier. That was a mistake! I now realize that the sugar was a critical ingredient to create the stickiness factor. Mine were a bit too crumbly to be considered functioning snack bars. But I still want to have a healthier version of this snack (I subbed raisins for the chocolate chips and used agave nectar). I’m not sure what the milled flax does when added to the peanut butter, but next time I’ll try using the flax and water egg substitute and add that separately. Does anyone know any other non-sugary vegan ingredients that can create this stickiness? Has anyone made these with fruit instead? can it be fresh or frozen fruit, or does it have to be dried? Since the mixture isn’t baked, I would only use fresh or frozen fruit if you will be eating them same day. Also, the fruit may squish or pop when your press the ingredients in. Dried really is best for this one, but you can omit if you don’t have any on hand. This recipe is very tasty, but even after pressing them together well and freezing for the recommended time, they were still pretty crumbly. They fall apart when you try to eat them. I will have to adjust the recipe so they hold together better. No I don’t, but you can calculate it using one of the free nutrition calculator sites. Can I put in all the ingredients in a nutritional calculator and then it will give me the proper serving size and nutritional information? I made these in the past and while they were crumbly they were quite good. I’d like to make them again, but I have a new problem: I’m finding coconut and I don’t get along. I’m a bit worried that palm oil is too similar–I honestly don’t know. Is there anything I can substitute that would perform the same function? Thank you! To help with crumbling, you might want to use all maple syrup in place of the brown sugar. As for a coconut oil sub, I recommend trying food-grade cocoa butter. Very yummy! 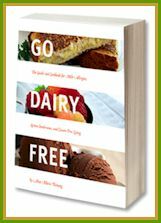 This post might help you, too – http://www.godairyfree.org/news/substitute-for-coconut-milk-and-oil. I make these for my hubbys lunch’s! They are so much cheaper then buying granola bars!!!!! He really likes them and I really like that they are natural, high fibre and have omegas, and are perfectly portioned…my kids and I really like them too! Thank-you so much for sharing this recipe!!! !